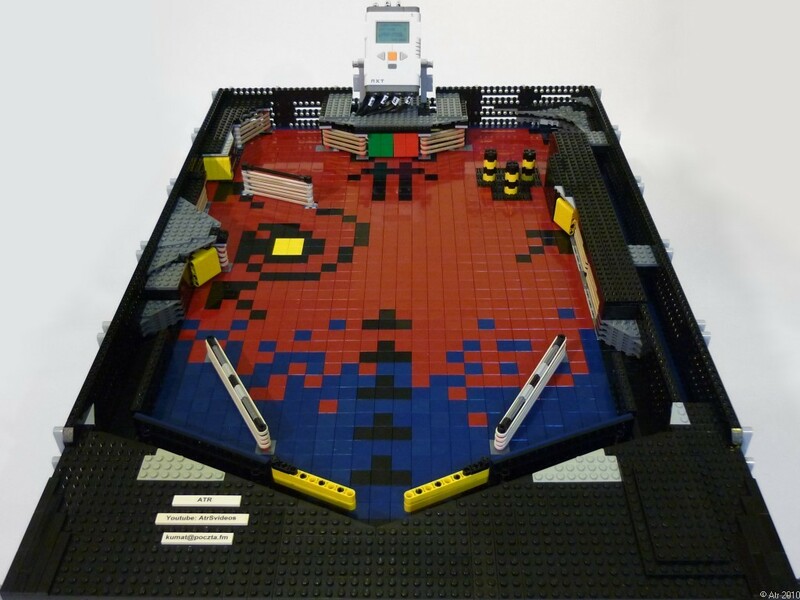 Atr user, posted this week at Eurobricks a Pinball machine he made based on NXT. Is is not the first working Pinball machine machine made with LEGO, but I still liked it a lot. In the author's words: "Pinball machine uses one NXT Brick, 4 touch sensors (3 of them are attached to one port) and 2 light sensors. Program is written in Java (LeJOS). After pressing orange button the ball is given and a new game is started. Every game has three balls total. If the ball is lost within 10 seconds after start, the ball is returned without losing one." Even there is a description about how the points are collected. Black Hole opens up every 500 points, then player has 20 second to get the ball into it. If 5 seconds is left Black Hole's light starts flashing. It is really awesome and worthwhile to see! It looks the playing experience is also really nice. You may look for additional photos from Atr Brickshelf folder.